Most public relations professionals know that a company’s reputation can be big factor in its long-term success. A positive public perception helps inspire employees, recruit new talent, protect a brand from negative PR, and differentiate its offering from that of the competition. When it comes to government relations and regulatory issues, a stellar reputation can complement an organization’s lobbying effort. It can even help a product or service command a higher price. However, a PR pro trying to explain the inherent value of reputation to shareholders, bosses, clients, or investors cannot simply rely on her charisma. The idea of placing a dollar value on abstract drivers like brand attachment, image, trust, and admiration may seem improbable upon first glance. So we took a close look at the four major annual reputation reports to see how it’s done. Measuring Corporate Reputation: Perception or Performance? Both the Harris Poll Reputation Quotient (RQ) and the Reputation Institute’s Reptrak survey the general public, while the U.S. Reputation Dividend Report and Fortune’s World’s Most Admired Companies list survey corporate executives and financial analysts. Perhaps not coincidentally, those that survey the public weigh brand perception over financial performance. A pivotal part of Harris Poll and Reptrak’s research centers on measuring the “pulse” or “emotional appeal” of a given brand. Meanwhile, the U.S. Reputation Dividend Report and Fortune’s World’s Most Admired Companies measure corporate reputation by surveying executives and directors from large companies as well as securities analysts. Since both rely on a formula that takes financial performance into account, we see very different brands hovering near the top. Both reports rank Walt Disney, Apple, Alphabet, Microsoft, and Starbucks in their top ten. But what do these rankings mean for a company’s balance sheet? Reputation Dividend’s formula links reputation to market value. The 2017 U.S. Reputation Dividend Report offers perhaps the clearest link between reputation and value to shareholders. 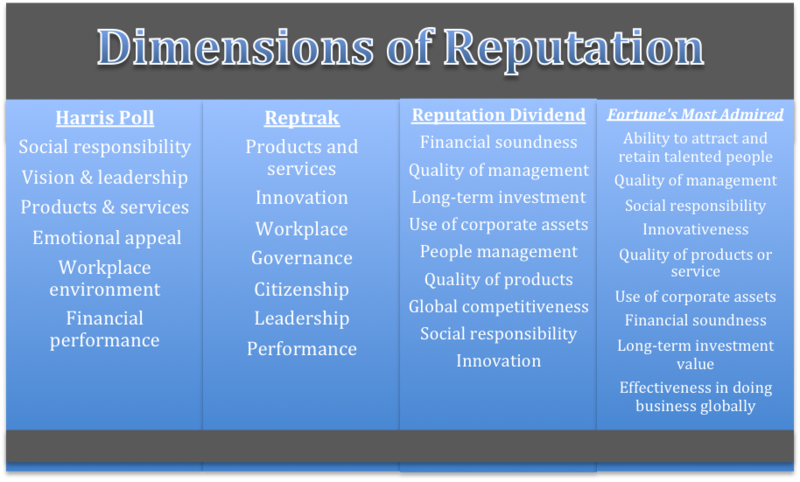 The Report uses data from financial variables plus its nine drivers of reputation. It states that in 2017, $1 out every $5 of market capitalization in the S&P 500 comes from “confidence underpinned by company’s reputation.” And there’s another tidbit that offers insight into its value. While 20% of a company’s value comes from its reputation, on average, the highest-ranked corporations derive more than 40% of their market capitalization from reputation. The Walt Disney Corporation finished in the top spot here, earning an estimated 52.5% of its value from its widely recognized reputation, or the equivalent of over $90 billion. So what does it all mean for reputation stewards at other, smaller organizations? While startups may not derive half their revenue based on corporate reputation, they should proactively build a culture-based reputation that grows along with the business. Early-stage companies may not be able to adopt this type of in-depth research, but the reputation drivers used are relevant to almost any business. They can be used to help inform brand values and external messaging, supported by specific “proof points” for each. Whether the value of reputation is measured by charting perception, performance, or both, a brand of any size or sector can benefit by treating it as a critical business asset.